MainAll NewsDefense/Middle EastReuters' Anti-Israel Bias? Reuters, cited in the past for extreme anti-Israel bias, may have cropped photos to favor the image of Muslim flotilla attackers. Reuters, cited in the past for extreme anti-Israel bias, seems to have cropped news photos to favor the image of Muslim flotilla attackers. 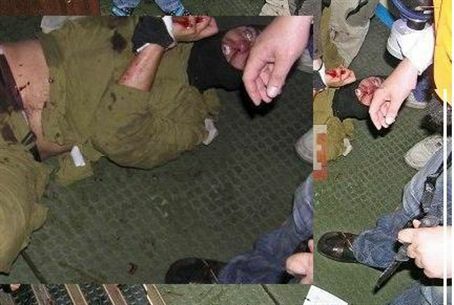 Reuters published the photo in the insert on the left side of the picture, showing one of the attackers without a knife. In what appears to be exactly the same as the photo on the right side, published by the leading Turkish daily Hurriyet, the picture includes the knife in the hand of the attacker, in the lower right corner. The pictures show the attackers trying to take an IDF Navy commando hostage on the Mavi Mamara ship, which was stopped by the Navy from continuing on course to Hamas-controlled Gaza Monday morning. The attackers' use of a weapon in the clash is an important news item because the “peace activists” claimed they were unarmed. Reuters apparently thought differently or simply did not want to incriminate the terror activists. In 2008, Reuters published a "fact box” on Jerusalem, omitting any mention that Arabs attacked Israel in 1947 and 1967 or that the Bible records the purchase of the city by King David. Instead, the news agency told its readers that Jerusalem “became the center of Jewish religion and nationhood" and mentioning the Holy Temple only in the context that the Romans destroyed it. Reuters dedicated three paragraphs to the Muslim claim to the city, failing to note that the Koran does not mention the city even once. The "fact box" also records the United Nations partition plan of 1947 but then omits any mention of the Arab refusal to accept the plan and its subsequent war against the new state of Israel. Instead, it told readers, "In fighting in 1948, Jewish forces took the western suburbs of Jerusalem and land linking it to the new Israeli state." In similar vein, Reuters did not mention that virtually every Arab neighbor staged attacks on Israel and instead wrote that "Israel and Arab states went to war again in 1967." In 2006, a Reuters cameraman was arrested and charged as a result of violent riots in the Arab village of Bil'in, in the Modi'in region. A videotape that the prosecution presented to the judge showed that he encouraged and directed rioters in Bil'in to throw large chunks of rock at Israeli vehicles in such a way as to cause maximum damage. He was heard shouting, "Throw, throw!" and later, "Throw towards the little window!"